When Hopalong Cassidy came to town. | Come Here To Me! « I miss the Tall Ships. When Hopalong Cassidy came to town. Hopalong Cassidy, a fictional cowboy hero created in 1904, was one of the most beloved characters of children worldwide for generations. The character inspired cartoons, comic books, television programmes and more besides, and even inspiring ‘Hoppyland’, an amusement park in Los Angeles, in the early 1950’s. 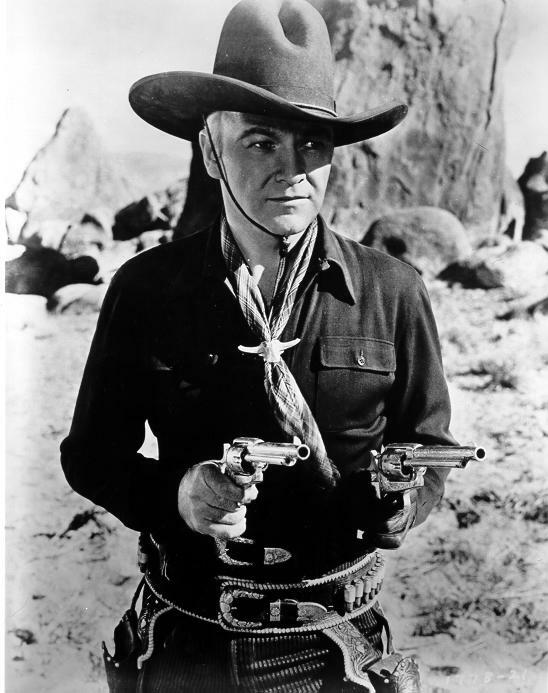 William Boyd was the actor who brought Hopalong Cassidy to international stardom. Indeed, the screening of the Hopalong Cassidy series featuring Boyd marked the beginning of a long running genre of such westerns on television, aimed at a young audience. Between 1935 and 1948 Boyd would star in a total of 66 Hopalong Cassidy western films, the last 12 of which he produced himself. It was the rise of television and the screening of the films on the small screen which would make an icon of Boyd from the 1950’s onwards. Below is the trailer for the first Hopalong Cassidy western. In Ireland, Hopalong Cassidy comic strips featured in the Irish Independent newspaper, and the character enjoyed huge popularity among the Irish youth. 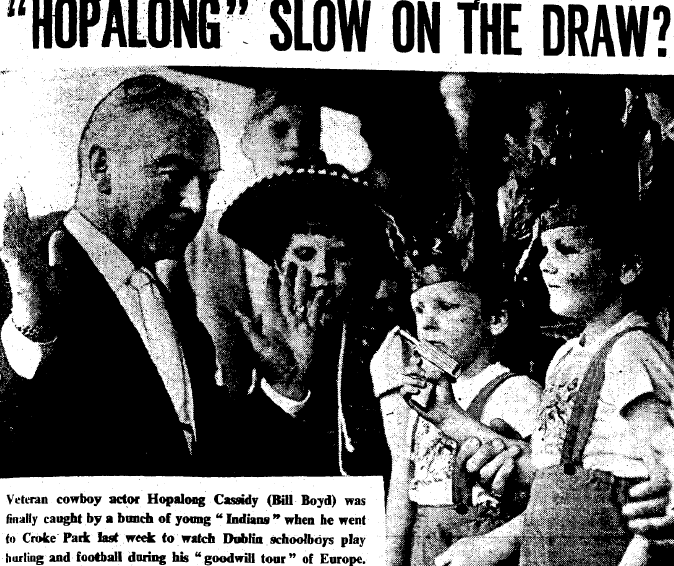 In July 1954, Hopalong Cassidy visited Dublin, grabbing national headlines and media attention. Boyd was joined by almost 100 youths, 48 of whom were from America and 46 from the UK. The event was advertised as being part of an “International Goodwill Tour”, which had seen the cowboy tour the UK and Ireland. Among the 100 youngsters were two Irish lads, with Norman Gedess from Belfast and Charles Vize od Decies Road in Ballyfermot. When Boyd landed in Ireland on 27 July 1954, they landed in Dun Laoghaire and were then treated to a dinner organised by the Variety Club of Ireland in Butlin’s, Co.Meath. Among those in attendances at the dinner was Alfie Byrne, the popular Lord Mayor of Dublin. Boyd was accompanied on the trip by over 20 UK and American pressmen, giving a good idea of his international appeal. An Irish Times journalist refered to a social function involving Hopalong Cassidy in Dublin as perhaps “one of the most curious social functions to take place in this stick-in-the-mud old town of ours”, noting that “a small, puzzled group of Dublin newspaper men stood awkwardly near the door, wondering what it was all about.” The journalist noted that so strong was the influence of American culture on young people globally, it was difficult to tell the British boys from the Americans. In the words of Boyd himself, the visit was apparently all about his “Operation Friendship”, and bringing boys of different nationalities together. As part of the brief visit to Ireland, the world-famous cowboy visited Croke Park where the boys took in exhibition matches in native games. The teams were made up of boys from primary schools on both sides of the Liffey, and Boyd presented the winning teams with medals on the day. Hopalong Cassidy at Croke Park, from ‘The Weekly Irish Times’. Butlins was magic. The only disappointment in my time there was Hopalong Cassidy. The actor William Boyd had become completely identified in young minds with this fictional cowboy character. Boyd was Hopalong Cassidy. So when he was scheduled to appear at a campfire in Butlins, during his short visit to Ireland, we were ecstatic. On the appointed night, we waited, and waited, and waited. But he never appeared. There were rumours of an excess of hospitality at a Croke Park function earlier in the day. A hero utterly destroyed for ever in the eyes of those eager young campers. 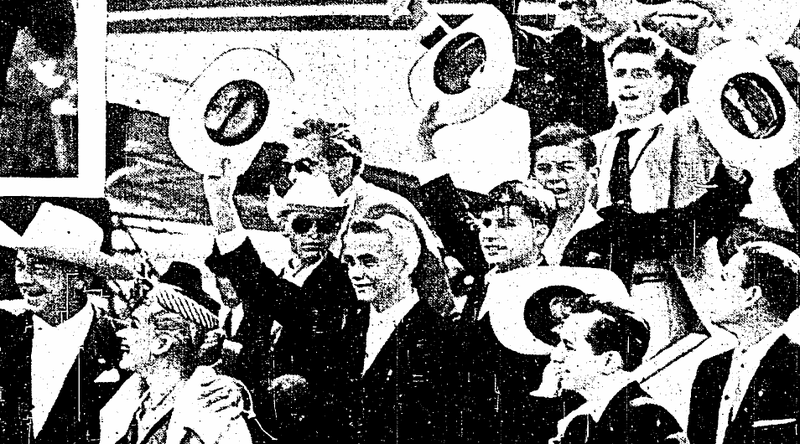 When Boyd and the ‘junior ambassadors’ were leaving Ireland, via a special flight from Dublin Airport, newspapers reported that hundreds of young boys and girls packed the airport, waving them off and creating a huge scene, as they departed for New York. The Sunday Independent captured the below image of their departure. Hopalong Cassidy remained an international icon for children here long after he departed Dublin Airport. Wiliam Boyd passed away in September 1972 and the age of 77. Was anyone at the Croke Park games, or did you meet Boyd on his visit to Ireland? Great article. My oul fella was born in 1922 and he loved cowboy pictures. He used to sing us to sleep with There’s a Bridal Hanging on the Wall and Ghost Riders in the Sky was his party piece. One of the cousins brought him home a genuine Stetson and his trip of a lifetime, before he left for the great prairie in the sky, was a trip to the Calgary Stampede. They used to show matinee cowboy pictures in the Corinthian on Eden Quay. It was said if you got there really early and went round the back you’d see them delivering hay and oats because there was so many horses in the pictures. As a seven year old I was on holiday in Dublin in 1954 with my family. We went to see Hoppy at Croke Park. I remember that he wore a white suit and a stetson. I think he came out on to the pitch at half time and talked to the crowd with a microphone. I know he apologised that he had not been able to bring his horse Tony. We were sat in the stand and when Hoppy emerged from the tunnell my Dad got to his feet Pointed and said “there he is” just as Hoppy looked our way and seeing Dad pointing waved to him. The Old Man remembered that Hopalong Cassidy waved to him until his dying day.. I remember the day very well. My parents brought myself and my brother from Boyle, County Roscommon to Dublin. We had lunch one of the days in Cleary’s restruant upstairs and during lunch the Manager brought us both up to the top table to meet Hop along Cassidy! Asked me if I liked cowboy movies and I said some I really liked all the horses and he laughed and told me I was a real young Irishman and be proud of that I was the envy of all my pals at home. Goof memories!! !